The financial difficulties of South Korean shipping line Hanjin has stranded good around the world, leaving merchants of everything from fashion to Christmas toys wondering when they will get their products. The bankruptcy of Hanjin shipping line has thrown ports and retailers around the world into confusion, with giant container ships marooned and merchants worrying whether tonnes of goods will reach their shelves. The South Korean giant filed for bankruptcy protection on Wednesday and stopped accepting new cargo. With its assets being frozen, ships from China to Canada found themselves refused permission to offload or take aboard containers because there were no guarantees that tugboat pilots or stevedores would be paid. "Hanjin called us and said: `We're going bankrupt and we can't pay any bills — so don't bother asking,' " said J. Kip Louttit, executive director of the Marine Exchange of Southern California, which provides traffic control for the ports of Los Angeles and Long Beach, the nation's busiest port complex. 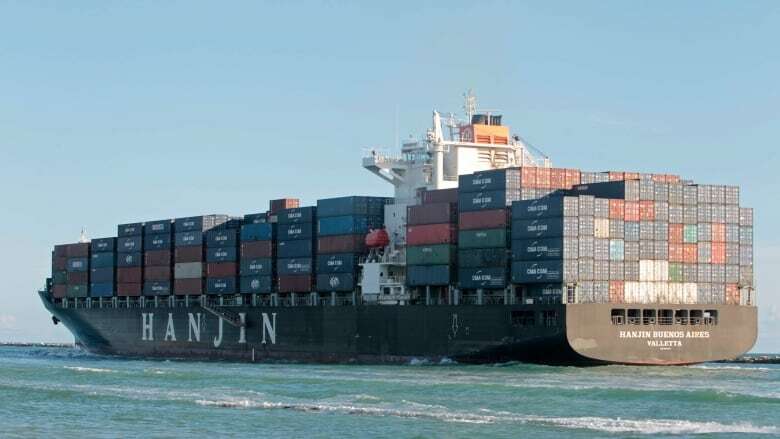 Three Hanjin container ships, ranging from about 213 metres to 304 metres long, were either drifting offshore or anchored away from terminals on Thursday. A fourth vessel that was supposed to leave Long Beach on Thursday morning remained anchored inside the breakwater. At least one Hanjin vessel is in a Canadian port. The 225-metre Hanjin Scarlet arrived at the Port of Prince Rupert on Tuesday night and anchored in the harbour, but has not been unloaded. DP World, which operates the container terminal operator, shipper CN and the Prince Rupert Port Authority are working on a solution that will allow the ship to be unloaded as early as next Tuesday, port spokesman Michael Gurney said. Hanjin's financial issues will affect Canada''s freight industry, Ruth Snowden, executive director of the Canadian International Freight Forwarders Association, said earlier this week. "It impacts Canadian importers and exporters because if I have a container on that vessel I can't get it," she said. Seoul-based Hanjin said Friday that one ship in Singapore had been seized by the ship's owner. Hanjin Shipping spokesman Park Min did not confirm any other seizures. As of Friday, 27 ships had been refused entry to ports or terminals, she said. That left cargo headed to and from Asia in limbo, much to the distress of merchants looking to stock shelves with fall fashions or Christmas toys. "Someone from the garment industry called earlier today asking: `How long is this going to go on, because I've got clothing out there,"' Louttit said. The Korea International Trade Association said about 10 Hanjin vessels in China were seized or likely to be seized by charterers, port authorities or other parties. Hanjin, the world's seventh-largest container shipper, represents nearly eight per cent of the trans-Pacific trade volume for the U.S. market. In the United States, the National Retail Federation, the world's largest retail trade association, wrote to Secretary of Commerce Penny Pritzker and Federal Maritime Commission Chairman Mario Cordero on Thursday, urging them to work with the South Korean government, ports and others to prevent disruptions. "Retailers' main concern is that there (are) millions of dollars' worth of merchandise that needs to be on store shelves that could be impacted by this," said Jonathan Gold, the group's vice president for supply chain and customs policy. "Some of it is sitting in Asia waiting to be loaded on ships, some is already aboard ships out on the ocean and some is sitting on U.S. docks waiting to be picked up. It is understandable that port terminal operators, railroads, trucking companies and others don't want to do work for Hanjin if they are concerned they won't get paid." Hanjin has been losing money for years. It filed for bankruptcy protection a day after its creditors, led by a state-run bank, refused to prop it up.